In 1913 a Danish director, I have no clue who, wanted to make a movie after a Norwegian folk story but the papers of the time say that people gathered in Christiania (now Oslo) to protest. 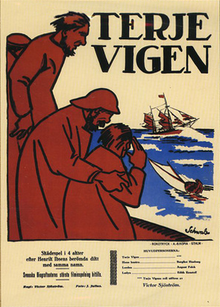 Some years later, the Swedish director Victor Sjöström made Terje Vigen (1917), a story after a poem, of the same name, by the Norwegian writer Henrik Ibsen. 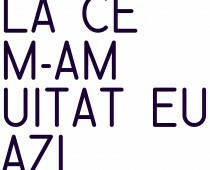 The story is simple adn straingth forward and does not require intellectual efforts in order to get through. Although, the poem struck a nerve in the Norwegian consciousness and now it is being heralded as an important cultural icon. The Norwegian Broadcasting Corporation (NRK) broadcasts every New Year’s eve, at midnight, a reading of the poem. About the movie, the cinematography is spot on, with clear photographic roots regarding composition, beautifully complementing the pastoral landscapes. The crosscutting in the race between the two boats is really impressive, be it historically, visually or for setting a sense of urgency and alarm. One should take into consideration the early stages in which these processes were in at the time, and with that in mind should give a more conscious opinion on what is presented before him. The idea of the time was that the Swedes should concentrate on quality and not quantity. This explains how Svenska Bio spent an astonishing amount of money for the time, 60,000 SEK, for the production of this film, thus starting what was later named “The Golden Age on Swedish Cinema”. Victor Sjöström will later become one of the most important directors of this period, often named “Sweden’s Griffith,” also being the author of what is now considered the masterpiece of the time, Körkarlen (1921) (on which he continued his cooperation with cinematographer Julius Jaenzon).